A pine tree donated by Turkish Rotarians commemorates those who served in World War One. 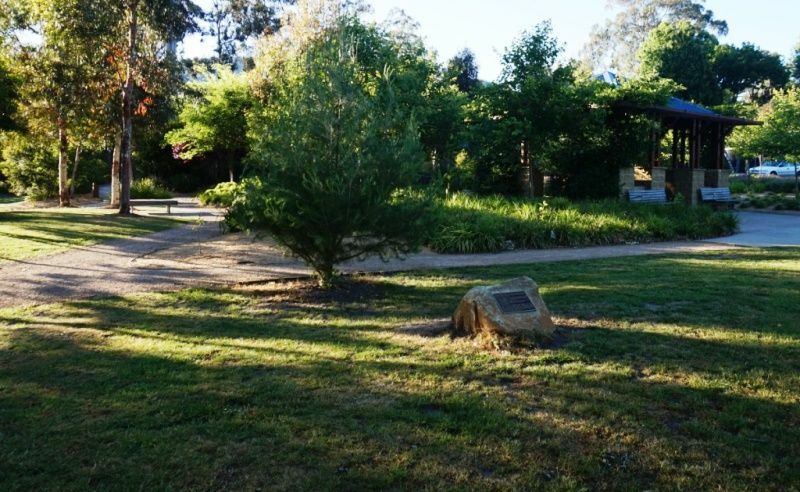 The pine tree was donated as a gesture of peace and goodwill and planted in the Gallipoli Park precinct which was restored after the 2009 bushfires. 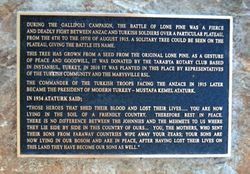 During the Gallipoli campaign, the Battle of Lone Pine was a fierce and deadly fight between ANZAC and Turkish soldiers over a particular plateau, from the 6th to the 10th of August 1915. A solitary tree could be seen on the plateau, giving the battle its name. This tree has grown from a seed from the original lone pine, as a gesture of peace and goodwill. It was donated by the Tarabya Rotary Club based in Instanbul, Turkey. 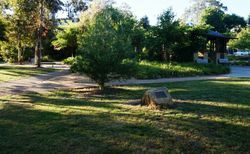 On 2010 it was planted in this place by representatives of the Turkish community and the Marysville RSL. The commander of the Turkish troops facing the ANZACs in 1915 later became President of modern Turkey - Mustafa Kemal ataturk.
"" Those heroes that shed their blood and lost their lives ... You are now lying in the soil of a friendly country. Therefore rest in peace. There is no difference between the Johnnies and Mehmets to us where they lie side by side .... You, the mothers, who sent their sons from far away countries. Wipe away your tears, your sons are now lying in our bosom and are in peace. After having lost their lives they are now our sons as well."